The Case in the Cafe was a series of events initiated by Kim? Contemporary Art Centre in order to investigate the connection of abstract ideas by penetrating some specific spots (authors, works, events) of art in 20th and 21st century Latvia and beyond, which in the framework of this investigation process and still being left without the presence of the “big” theories works for a further construction of informative perception. 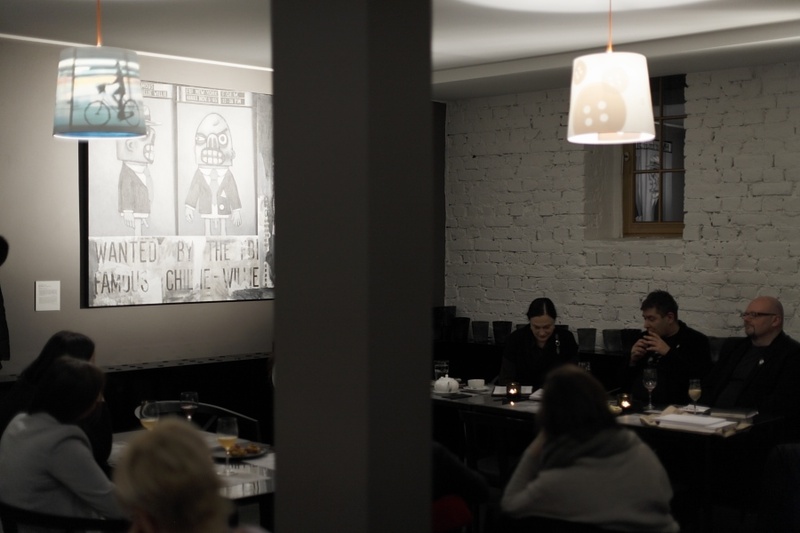 As part of the event series “The Case in the Café” a talk titled “Art, Humour and Crime” washeld in the Restaurant Kitchen on December 8 at 17.00 with the opening of the catalogue of the exhibition by Normunds Brūveris “Famous Chillie Willie in Riga”. The artist’s painting “Wanted by FBI” (2006) were exhibited in the restaurant until January 29, 2012. “A crime committed as part of a work of art often amuses the viewer. Yet to maintain a sense of humour it is important for the committed crime to remain within the art territory. That is, the crime should not occur in the personal life of a particular viewer or concern the viewer directly. Yet types of art vary in ways they are distanced from the real, physical world. Therefore this is how it should work: the smaller this distance, the more we perceive the nature of crime and the less amusement it brings,” – contemplates Ieva Kulakova. The potential for amusement is expected to be touched upon in the talk “Art, Humour and Crime” by its participants: art historian and curator of the exhibition Ieva Kulakova, philosopher Artis Svece, and Edmunds Frīdvalds, writer and author of the 41 miniature published in the catalogue.